Barrington artist, Penelope Manzella, generously donated two oil paintings to the City. 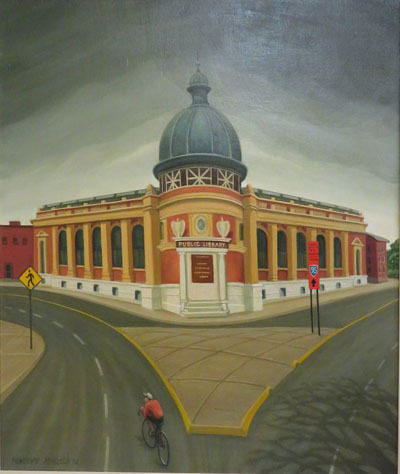 Mills Across the Blackstone depicts a view of mill buildings looking east from the bridge on Central Avenue and Pawtucket Library shows the Gerald S. Burns wing of the library looking at it from the intersection of Summer and East Avenue. Both paintings now hang in the Pawtucket Public Library. 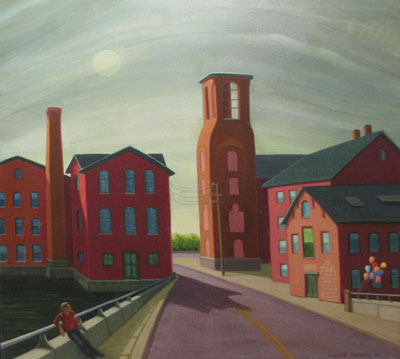 Over the years Manzella has painted numerous scenes of Rhode Island mill buildings, particularly those in Pawtucket, in a style that evokes nostalgia. The architectural forms are often depicted under moody skies in stark settings with lone figures. She says of her paintings, “I work to make the paintings interesting, to evoke an emotional response - stir a memory." 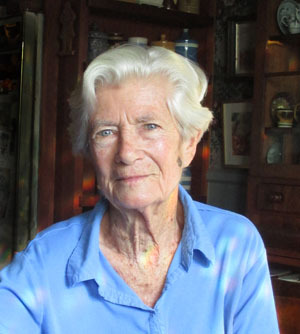 Manzella, a long-time resident of Barrington, graduated from Columbia University’s School of Painting and Sculpture and continued her studies in California, Illinois, and Florence, Italy. Early in her career she worked in both painting and sculpture but now engages only in painting. She has had gallery associations and exhibitions throughout Rhode Island, Massachusetts, and Maine. This past September and October her paintings were shown in Gallery 175 in the Visitors' Center in downtown Pawtucket. In 2012 the Pawtucket Arts Festival featured one of her paintings of Pawtucket mills on its festival poster.